Since getting the Instant Pot, it’s been fun mastering pressure cooking. Although many of my friends refer to it as a “magic” pot, the reality is that understanding the pot and cooking times and various functions is still necessary. For example I always wondered why whole chicken recipes always seemed to deliver on the promise that the meat would fall of the bone, the problems was that too much pressure cooking time would often mean that the meat would have a squishy mushy texture. This would never happen to red meats like beef, lamb and pork, but poultry is a little more delicate and I think the cooking times need more precision. I’ve been itching to braise chicken in the pot for the longest time. The problem however is that Braised Soy Sauce Chicken (or what I’m used to) has to be tender and succulent and just cooked through and never over done. For one, the glistening skin of the chicken has to be intact so that chopping the chicken gives neat and pristine pieces to serve alongside the braised tofu and eggs. Pressure cooking whole chicken according to the Instant Pot website is 20-25 minutes so I figured that when I’d tried this cooking time for whole chicken before in the IP that I had the slightly overcooked and mushy texture, so I cut the cooking time down to 15 minutes with a short 5 minute natural pressure release time. I’m happy to say it worked perfectly as the chicken was just done; the wings fell off when retrieving the chicken from the pot, but otherwise the rest of the chicken stood up well to separating the parts and chopping. 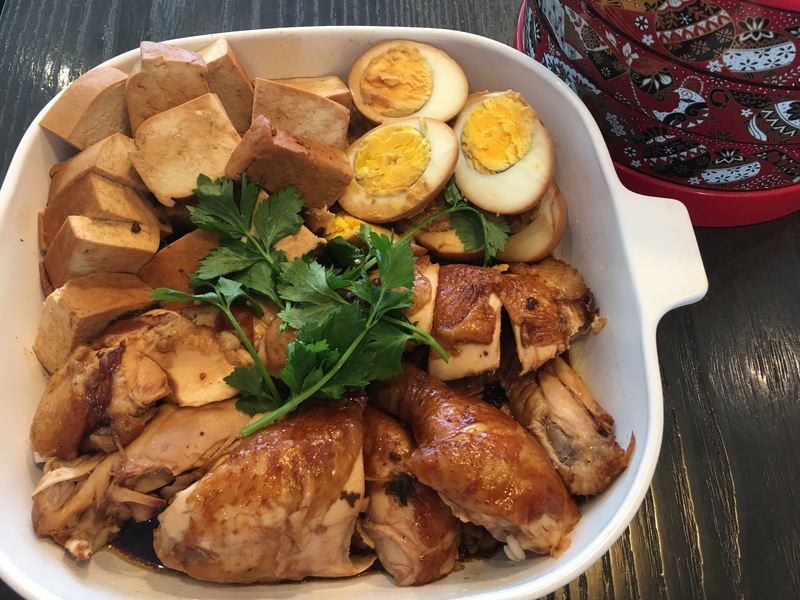 Braised soy sauce chicken is also a pretty traditional dish in Chinese (or at least South East Asian) cooking and because Chinese New Year is coming soon, I figured that I would try a few chicken dishes as a dry run. It happens to be the Year of the Rooster and people have been making really cute chicken-shaped pineapple tarts and buns. Unfortunately I think this is the one animal in the Chinese Zodiac Calendar whose year it is and who gets eaten up as well. Still, this braised soy sauce chicken (Si Yau Kai) is good for anytime of the year and the pressure cooker recipe is definitely a keeper! Prepare the eggs. Pour 1 cup of water into the pot. Place the eggs in a steamer insert in the pot. Seal the lid and put on manual high pressure for 5 minutes, allow natural pressure release for 5 minutes, then remove from the pot and put in an ice water bath. Peel the eggs and set aside. Heat up the olive oil in the pot. Sauté the garlic, spring onions and ginger for about 4-5 minutes to caramelize slightly. Add the soy sauce, sugar substitute, cinnamon stick, star anise, cloves and peppercorns. Place the chicken into the pot, breast side up. Add enough water (about 1.5 L) to immerse the whole chicken. Seal the pot and put on manual high pressure for 15 minutes. Allow natural pressure release for 5 minutes, then open the pot. Gently lift the chicken out of the pot, being careful not to tear the skin. Set aside. Put the Instant Pot into saute mode and put the firm tofu and peeled eggs into the pot and boil for 10-15 minutes. Alternatively, put pot in “keep warm” mode and leave to braise for longer until ready for the meal. Take about 1 1/2 cups of the braising liquid and simmer in another pot on the stove for about 10 minutes to reduce and thicken the liquid. Cut the chicken, taking off the thighs and drumsticks first before slicing the breast meat up. Put in a large serving platter. Cut the firm tofu into 1 – 1.5 cm thick slices and cut the hard boiled eggs into half and plate together with the meat. Gently drizzle the reduced braising liquid over the meat, tofu and eggs. Serve warm. The remaining braising liquid can be strained and refrigerated, to be used for cooking at a later date, e.g. making braised hard-boiled eggs or tofu or peanuts. Would a 6 qt instant Pot be required for this recipe? I’ve just ordered a 3 qt and now wondering if I’ve made a huge mistake. Wondering if a small chicken could be done in the 3 qt. I’ve not had experience using a 3 qt…perhaps a small chicken or using chicken parts may work. how much cook time and pressure release time do you recommend for chicken that is cut up? What is sugar substitute? Can I use rock sugar? I usually use erythritol (swerve) or monk fruit sweetener. Rock sugar is like regular sugar and very high in carbohydrates. Did you really use 400mls of light soya sauce? I did that and the dish was incredibly salty. Or maybe you used a low-salt brand? Yes. In Singapore the light soy sauce is less salty I think. I use the Lee Kum Kee brand.